We’d love your help. Let us know what’s wrong with this preview of 1421 by Gavin Menzies. On 3/8/1421, the largest fleet the world had ever seen set sail from China. Its mission was "to proceed all the way to the ends of the earth to collect tribute from the barbarians beyond the seas" & unite the whole world in Confucian harmony. When it returned in 10/1423, the emperor had fallen, leaving China in political & economic chaos. The great ships were left On 3/8/1421, the largest fleet the world had ever seen set sail from China. Its mission was "to proceed all the way to the ends of the earth to collect tribute from the barbarians beyond the seas" & unite the whole world in Confucian harmony. When it returned in 10/1423, the emperor had fallen, leaving China in political & economic chaos. The great ships were left to rot at their moorings. Most records of their journeys were destroyed. Lost in China's long, self-imposed isolation that followed was the knowledge that Chinese ships had reached America 70 years before Columbus & had circumnavigated the globe a century before Magellan. Also concealed was how the Chinese colonized America before the Europeans & transplanted in America & other countries the principal economic crops that have fed & clothed the world. To ask other readers questions about 1421, please sign up. Recommended to Andrew by: My father!! and he liked it! There are books that break new ground with bombshell research and there are books that spellbind us with the skill of their deception. This book is the latter. Menzies takes a tremendous dump on the sensibilities of his readers, bombarding us with outrageous claims backed up with erroneous facts and arrogant speculation. A typical "fact" presented by Menzies is introduced with "By this point I was sure..." or "I realized that Zhou must have...." or even "From my days as a navigator, I knew that There are books that break new ground with bombshell research and there are books that spellbind us with the skill of their deception. This book is the latter. Menzies takes a tremendous dump on the sensibilities of his readers, bombarding us with outrageous claims backed up with erroneous facts and arrogant speculation. A typical "fact" presented by Menzies is introduced with "By this point I was sure..." or "I realized that Zhou must have...." or even "From my days as a navigator, I knew that ...." Then Menzies will absurdly postulate about what the Treasure Fleet MUST have been doing in uncharted territory, with no trace of written or oral record, halfway across the globe nearly 600 years ago. He claims he knows the exact date that the the Fleet passed certain islands in the Caribbean due to their haphazard presence and occurrence on later European charts (the absence of the moon excuses when these oddly shaped islands are misrepresented or missed on the charts). Then he will wax appreciatively about how precise Chinese navigators and cartographers were, attributing stone structures (Menzies' alleged observation decks) all around the globe to Chinese astronomical prowess and their desire to properly construct latitude and longitude by measuring eclipses all across the globe. Of course, the Chinese never bothered to go back to these places to collect the results. Nor did they return to the dozens of colonies they set up everywhere from South America to Massachusetts to Gympie, Australia. Nor did they return to collect the fruits of the mines they set up all over the world. Menzies will say that this is because of the isolationist policy China soon after adopted. But if you really think about, and if you read later editions' postscripts and visit his website - you will soon realize that he is trying to collect all of the unaccountables and unexplainables of history and wrap them up in a flimsy and manipulative description of a massive journey and colonization campaign that most likely never even happened. This book is the nadir of pop history, and, sadly, it shows how dedicated propagandists have been stretching history to their own means for centuries - mix your audience's curiosity and ignorance with a fantastical proposition and then support it with smart and thorough sounding explanations based on baseless facts, and then sit back and let their imagination take hold. "Linguistics provide further evidence. The people of the Eten and Monsefu villages in the Lambayeque province of Peru can understand Chinese but not each otherâ€™s patois, despite living only three miles apart. Stephen Powers, a nineteenth-century inspector employed by the government of California to survey the native population, found linguistic evidence of a Chinese-speaking colony in the state." The first assertion, on the Peruvian village, is not sourced at all and is either the personal fancy of the author or some minor crank idea. The second, however, is cited to an 19th-century bit of scholarship evidentally done without appropriate field methods. He goes on to claim that Chinese sailors shipwrecked on the East Coast of the United States would have been able to communicate with locals, as these would have included Chinese who had walked over the Bering Strait. Chinese walk across to Alaska and across all North America, but end up speaking Middle Chinese, and yet leave no trace of this dialect on neighbouring Native American languages? Risible fantasy. There's even an assertion that Navajo elders understand Chinese conversation, and an assertion that the Peruvian village name Chanchan must be Chinese because it sounds (at least to him) like "Canton". Perhaps the silliest Peruvian connection is between Chinese "qipu" and Quechua "quipu"; Menzies seemingly doesn't understand that "q" represents a completely different sound in each language. So, I hope that the reader with some training in linguistics can see what kind of arguments are used in the book, and beware accordingly. Sure 1421 has plenty of hearsay and conjecture, and some entertaining theories put forth by Menzies, most of which can't be backed up with factual evidence at this time. Obviously by reading the subtitle ...The Year China Discovered America you get the gist that Menzies asserts a China-first-to-the-Americas hypothesis. China was on the forefront of invention once upon a time. Gunpowder is one example. But shifting firmly entrenched belief that old European explorers were first to the Americas ta Sure 1421 has plenty of hearsay and conjecture, and some entertaining theories put forth by Menzies, most of which can't be backed up with factual evidence at this time. Obviously by reading the subtitle ...The Year China Discovered America you get the gist that Menzies asserts a China-first-to-the-Americas hypothesis. China was on the forefront of invention once upon a time. Gunpowder is one example. But shifting firmly entrenched belief that old European explorers were first to the Americas takes some imaginative thinking. We know that the impressive China fleet of the 1400s sailed to the Middle East and Africa, but did they turn around and hit up the Americas at some point? Certainly the natives (Inuit all the way down to South America) have a certain Asian look to them, but the Bering Strait land-bridge theory already covers that. There's just not enough evidence to prove otherwise. Hoo boy, what can I say. This book is heavily mired in controversy, and here's why. First, it makes an extraordinary claim: that Chinese explorers in their 1421-23 exploration didn't just map the Indian Ocean, as generally accepted, but also visited West Africa, both coasts of South America, the Caribbean, and even left colonies in New England and Greenland. Second, since much of this hasn't been sufficiently researched, it doesn't have the goods to back a lot of it up. All it has is an extremel Hoo boy, what can I say. This book is heavily mired in controversy, and here's why. First, it makes an extraordinary claim: that Chinese explorers in their 1421-23 exploration didn't just map the Indian Ocean, as generally accepted, but also visited West Africa, both coasts of South America, the Caribbean, and even left colonies in New England and Greenland. Second, since much of this hasn't been sufficiently researched, it doesn't have the goods to back a lot of it up. All it has is an extremely interesting hodge-podge of facts, figures, intriguing maps, unexplored wrecks and spotty journal entries (most of the accounts of the voyage were destroyed when the explorers returned home to find that the Empire had turned inwards). It reads like an historical mystery novel, which is sort of what it is. For something that may be a completely fake history, it's sure entertaining. It certainly has some questions that "the standard model" does not answer; incredibly accurate maps that appear to predate the discovery of their contents by people who knew how to make maps; sunken wrecks where and when there shouldn't be; evidence of Chinese-Mayan trade and cultural exchange; anecdotal accounts of a Chinese colony in Greenland; etc. Menzies, being an ex-sailor himself, knows a lot about sailing and brings the voyage to life, an impressive feat given that we know virtually nothing about anyone who was on it. He just doesn't succeed in bringing it to reality. Too little is known, much rests on conjecture and indeed many of Menzies' theories have been debunked since it was written. My own environmental studies professor at Grinnell College pretty much discredited the whole Caribbean argument. Several other pieces of evidence have been shot down as well, from all I've read, and many of the maps and wrecks are not what they seem. Some, like an astounding map of Greenland that turned up in the back of someone's car, may even be forgeries. But that, I think, is the point. This book is not designed to prove that this voyage really did all that he thinks it did. It is a theory. There is a lot of scattered evidence for the theory, and it needs to be investigated, because if it were true it would be stunning. The book is basically an opening salvo in an argument that is complex enough that it will likely take years to sort out. (A lot of ships have be dug up from the ocean floor, for starters.) Most or all of that argument may prove to be bunk, but that's the nature of history. You might have that certain relative in your family who is affable enough, but has some really weird ideas that he loves to go on about. For the sake of this review, let's call him "Uncle Gavin." Uncle Gavin is harmless, and charms your friends, but he has one pet topic that you try to steer him away from. Before you know it, he's started asking your friends who they think discovered the world and after a short time, the friend's nods and smiles go from sincerely interested to polite to barely h You might have that certain relative in your family who is affable enough, but has some really weird ideas that he loves to go on about. For the sake of this review, let's call him "Uncle Gavin." Uncle Gavin is harmless, and charms your friends, but he has one pet topic that you try to steer him away from. Before you know it, he's started asking your friends who they think discovered the world and after a short time, the friend's nods and smiles go from sincerely interested to polite to barely hanging on, and they're looking around desperately for someone to rescue them from this conversation. Uncle Gavin wrote this book. His premise sounds interesting, and perhaps sane, if far-fetched: he claims that the Chinese sailed essentially the entire world in 1421-23 and made maps of such voyages that were later used to guide the Portuguese and Spanish explorers who "discovered" America and other parts of the world. Why this has been a hidden fact for so long: the Chinese burned nearly every record of the voyages, stopped exploration, and basically forgot about the whole thing over the centuries. Why Uncle Gavin is the only person to have figured this out: he used to captain submarines and therefore knows how ocean currents work and can read a nautical chart. I'll let that sink in for a moment. "Just because Verrazzano compared some lighter-skinned Indians and their manner of dress to the "Eastern" style doesn't mean that they are descended from his [Menzies'] imaginary pregnant concubines that were put ashore from his imaginary overcrowded voyages." I was going to list more, but as I look at that one, I think it sums up everything. Look, it's an interesting idea that the Chinese could have sent an enormous fleet out to see what there was out there, and that they could have drawn up a map of everything, and then decided to close their borders and give up on the outside world, and that the maps could have ended up in the hands of the European explorers, and that those explorers could have found knick-knacks that were Chinese and people who might have been descended from Chinese people who ended up there long-term one way or another. But if you're going to tell me, Uncle Gavin, that the Chinese took out 40 or 50 ships which were wrecked in various places and stayed and lived there, you're going to have to come up with some physical evidence. Wrecked ships off India, or eastern Africa, or Australia simply do not prove that Chinese people built the Bimini Road in the Caribbean to get their ships on land for repairs or had a settlement on Greenland (I am not kidding. I wish I were kidding.). If this were half as long and half as crazy, it might be worth a perusal. As it is, run from this book. Read Foucault's Pendulum, which features the same sort of wild connect-the-dots game and also has going for it that it is fiction. I have to say that I enjoyed reading this book, if only because it made me so angry at the gross inaccuracies and completely imaginary scenarios that the author made up. He claims to have information from anthropology, archaeology, geology, geography, history, etc, but what he really has exists only in his own mind. Read on, intrepid reader, and be amazed as the author sidesteps issues which threatens his ideas, or completely ignores them! There is absolutely no traceable path for his research, I have to say that I enjoyed reading this book, if only because it made me so angry at the gross inaccuracies and completely imaginary scenarios that the author made up. He claims to have information from anthropology, archaeology, geology, geography, history, etc, but what he really has exists only in his own mind. Read on, intrepid reader, and be amazed as the author sidesteps issues which threatens his ideas, or completely ignores them! There is absolutely no traceable path for his research, so scholars cannot even see how he came to his conclusions. Even better, some of his citations are inaccurately recorded to the point that one wonders if he's even read them! Do you like pseudo-history from rank amateurs that draw wild conclusions from scant evidence while discounting, in almost all situations, the simplest explanation in favor of conspiracy theory level conclusions? Recommends it for: Abbie, and any history or China buffs. Recommended to Jeff by: David, my stepfather. While this book presents itself as a revelation, it lacks citations or footnotes or much evidence for that matter to support such wild claims. I am not some jaded professor who believes in the current historical status quo, but to make such claims without good scholarly follow-through just begs for it to be debunked. Don't get me wrong, it was an entertaining read, which is why it got 2 stars and not one. But ultimately it is a futile book. The reason History is a social science is partly becaus While this book presents itself as a revelation, it lacks citations or footnotes or much evidence for that matter to support such wild claims. I am not some jaded professor who believes in the current historical status quo, but to make such claims without good scholarly follow-through just begs for it to be debunked. Don't get me wrong, it was an entertaining read, which is why it got 2 stars and not one. But ultimately it is a futile book. The reason History is a social science is partly because new evidence and information is peer-reviewed. If the evidence supports further research or re-evaluates long-held historical notions, then it is absolutely necessary to do so. I don't think there is such a pro-Western or anti-Chinese conspiracy among modern historians that the "terrible truth" in this book would be willfully ignored. As there are many examples of historical revisions that were necessary because of new evidence or racism and bigotry in the original historical perspective, I can only guess that Gavin Menzies had reason to believe that his "evidence" wasn't strong enough. In addition, he conflates history for which there is strong evidence with unsupported theories. For example, there is plenty of written and physical evidence that the Chinese were trading and sailing to the East African coast. But there is no substantiated evidence that they rounded the Cape of Good Hope. There is also evidence that the Chinese were well aware of many land masses throughout the South Pacific, but no evidence to support them landing and colonizing Australia or New Zealand. Menzies also claims DNA evidence of Chinese intermixing with aboriginal populations around the world. We all know that DNA evidence, while not conclusive, would certainly be very strong proof. So why isn't this data cited? It is well-established that the most powerful agent of change when the New World came into contact with the Old World was disease. Since there is evidence of Sino-European contact during the Roman period, and both populations had enough density to be cauldrons for the same diseases, why didn't supposed Chinese contact with Native Americans or Australian Aboriginals result in devastating plagues? This to me is Menzies' largest theoretical hole, large enough to sail a treasure ship through. On a much smaller note, the images that are in the book as well as some of Menzies' physical evidence are suspiciously inexact. Why not display images of the plinths with Chinese characters from Australia and West Africa and the Cape Verde Islands? Why not show the Mao Tsu statue "found" in Australia or the Gympie Pyramid? I suspect these are not shown because of the utter dearth of testable data or clear evidence supporting his theories. It is unfortunate that his claims are presented so sloppily and amateurishly that they invite such damning criticism. First off, I will start off by saying that I do NOT believe the Chinese beat the Europeans to the New World. I just think the evidence just is not compelling enough. However that doesn't mean that they could NOT have. They certainly had the navy, the navigational skills (no worse than the Europeans), and the funding and ingenuity to accomplish it. And that is precisely what this book seeks to theorize. Of course there is not any historian that wants to make any money "theorizing" unless you are First off, I will start off by saying that I do NOT believe the Chinese beat the Europeans to the New World. I just think the evidence just is not compelling enough. However that doesn't mean that they could NOT have. They certainly had the navy, the navigational skills (no worse than the Europeans), and the funding and ingenuity to accomplish it. And that is precisely what this book seeks to theorize. Of course there is not any historian that wants to make any money "theorizing" unless you are stictly in the academic community. In which case you then are not making any money. Gavin Menzies has decided to theorize that the Chinese could and did in fact do exactly what the title promises. He makes a compelling case and this book is very readible to the amateur history buff. Which is why it gets 4 stars. You will read and really think that maybe the textbooks have been wrong the whole time. But like any good, compelling history, the reader should now get enough information and go find out for themselves what is really believable. Especially with a theory like this one that would literally turn history on its head. And after doing some further reading, you realize that Mr. Menzies simply does not have enough solid data to support this claim. So much for all that crap they taught us in school about who discovered America! The Chinese did it first. All the European explorers were following charts that the Chinese had created in the early 1420s. Its fascinating to see how the revelation of what "really" happened developes for the author as he travels all over the world finding evidence in shipwrecks, artifacts and structures, plants and animals, languages and customs, and genetic markers in the indigenous peoples of Africa, the New Wor So much for all that crap they taught us in school about who discovered America! The Chinese did it first. All the European explorers were following charts that the Chinese had created in the early 1420s. Its fascinating to see how the revelation of what "really" happened developes for the author as he travels all over the world finding evidence in shipwrecks, artifacts and structures, plants and animals, languages and customs, and genetic markers in the indigenous peoples of Africa, the New World, and Australia and New Zealand. This book, and its accompanying website that is constantly being updated with new evidence from around the world, are going to change how we teach history. This is a difficult book to rate, let alone review. This review, therefore will probably jump around a bit, contradict itself, confuse you, and end up being awkward and poorly edited. First to a rating, as this may focus my train of thought. If I rated on readability - 4* - it is readable, presented relatively simply, but unfortunately is prone to some repetition. If I rated on engagement, or how much appeal the subject matter has - 4*. If I rated on how the book deals with presenting evidence in a s This is a difficult book to rate, let alone review. If I rated on how the book deals with presenting evidence in a scientific manner - 2* (more on this later). If I rated the book on my irritation as the author manipulates assumptions and presents them as evidence, I would rate it 1*. Overall, I think I am fence sitting at 3*. I do own another two books by Menzies, and I will read them, which means I can't really rate this less than 3*, or I wouldn't feel able to read more. And so, to content. As I read this book, I started out making notes of some bits to refer to in my review. This got out of hand very quickly, and I stopped completely. As other reviewers have said, Menzies is an "amateur historian". This is obvious from the outset - he even states it up front, and makes no apology for it. It does cast doubts, and while he constantly refers to his cast of scientists supporting his theories, they seem background characters, and their credentials are seldom shared. That is not to say that Menzies THEORY is not possible, or even plausible. There are certainly some compelling arguments, examples and THEORIES which seem essential to follow up. In this book, certainly, there seem so many that it is perhaps reckless of the scientific historian community not to be following this up. However that is part of the problem with this book - it is probably unfair to expect Menzies to write about the other side of his assumptions and theory - why would he present the evidence that doesn't fit. It is because of the amateur nature of this book that at no time does the reader feel they are being offered an opportunity to decide anything. Menzies takes this choice out of our hands. He simply tells us what he believes happened, and that we should believe him. One of the most annoying aspects of his writing, is his use of repetition, and subtle changes to the repetition to strengthen his position. During the narrative he regularly starts of with an assumption - a mere speculation that fits some vague evidence. Some pages later he will return to that assumption, and add a further layer of speculation, restating it as likely. Later again he will confirm this as fact, evidenced by X an Y theory. In his summary chapters the original "fact" is a certainty. This process undermines his evidence, in my view. Another trait which lessens the effect of his narrative is his repetitive use of phrases to sell his assumption. "By this point I was sure...", "I realized that Zhou must have...." and "From my days as a navigator, I knew that ....". The use of these phrases, in my view changes this from a serious historical investigation to a game of join the dots. However, his presentation methods aside, it is still a fascinating THEORY. There can be no doubting the depth of Chinese Culture. Winchesters Bomb, Book & Compass: Joseph Needham & the Great Secrets of China goes some way to describing the technological achievements of the Chinese, and there is no reason to think that navigation and seamanship should not have been ambitions of China. Menzies helper scientists were also in the process of DNA testing at the time of publication, and he uses the postscript in this edition in a couple of ways. One is to throw around some proof of Chinese DNA in pretty much all of the native peoples of the world from American Indians to New Zealand Maori, from native Alaskans (Aleut) to the Incas and Australian Aboriginals. Again we are just told this is incontrovertible proof - but it is not explained (but to be fair, I probably wouldn't understand it either). The other thing he does is take a return swing at some of the academics who have challenged aspects of his theory. This is sort of an easy way for him to scope points, as he can pick one or two of the challengers, present their argument as he wishes to and then respond. I think it lacks the professionalism required in an impartial and formal challenge to history. The flotilla of ships splits up into many, many routes, and basically not only returns some of the envoys, but carries on to discover almost the entire world, from Antarctica to Greenland, both coasts of Africa and South America, North America, the Azores, Caper Verde, the Caribbean, Australia and New Zealand. Also the obvious ones - India, the Spice Islands, parts of the Middle East and Indonesia. Pretty much all but Europe (I understand that Europe is suddenly on the table in Menzies next book, called 1434). They not only visited, they accurately surveyed and charted the extent of their travel, and even set up numerous colonies. This, all far before the Portuguese and their Age of Discovery, and long, long before the Dutch explorers and James Cook etc. More than just beating them to it, according to the theory, every single one of those famous explorers were in possession of the Chinese originated maps, and therefore were not heading off in discovery, but were simply following the map to places they knew existed! They just never really told anyone. And the reason that China holds no substantial written (or oral) history on this? There was a fire which destroyed the Forbidden City. As a result the emperor lost his nerve (to do with the gods revoking his mandate to rule) and China shut her borders, and destroyed all the evidence of their explorations, and suppressed all records. Anyway that is the very short version. But I have written enough, and need to put this review to rest, as it is approaching TL;DR. I tried so hard, you guys. I wanted to love this book. I mean, turning all of western exploration on its head? YAAAAAAAAAAAS. But here's the thing: this book is not a non-fiction history book. This book is pure speculation based on the experiences of one man with no background in history. Like, his entire premise is "I was in the navy, therefore I can read charts and most historians can't." It literally took all of my self control not to put this book on my fantasy, alternate DNFed on page 237. But here's the thing: this book is not a non-fiction history book. This book is pure speculation based on the experiences of one man with no background in history. Like, his entire premise is "I was in the navy, therefore I can read charts and most historians can't." It literally took all of my self control not to put this book on my fantasy, alternate history and historical fiction shelves. Is it possible that expeditions from China sailed to Africa, Australia, New Zealand, South American, Central America and North America? Yes. Is there historical evidence for most of these? No. Menzies provides historical sources for Chinese expeditions visiting Africa, but after that the sources dry up. Additionally, all of his sources are secondary documents which he claims were based on Chinese sources, but for which there is no evidence because apparently the Chinese emperor ordered all reference to the expeditions destroyed when they returned to China. Menzies doesn't read Chinese, and therefore can't have examined any primary documents himself. So after the fleet leaves Africa, the rest of the book is pure speculation: lots of "I knew instantly that X, Y, and Z" and "chickens in South America lay blue eggs, which is a uniquely Asian chicken trait, therefore the only possible conclusion is that the Chinese fleet landed in South America" and "there's an Aboriginal rock painting of a huge animal with a dog-shaped head. The only possible conclusion is that it's a milodon which the Chinese fleet brought with them from Patagonia" and "I found this rock with swirly patterns on it in New Zealand. There's a similar rock with swirly patterns on it in Central America. THE TWO MUST HAVE BEEN LEFT AS MARKERS BY THE FLEET!" In short, it's a lovely idea and I wish to God it were true. And it's a very readable (if rage inducing) book. However, Menzies sounds increasingly like the Captain of the HMS Tinfoil Hat Brigade as the book progresses. Ok, so this was really interesting and he had a pretty good basic thesis. In fact, I could totally buy the most important 10% of his theory. Basically, no one disputes that the Chinese had this enormous fleet that set sail in 1421 and went across the Indian Ocean to the east coast of Africa. They were sent on a mission to trade with different countries and basically tell everyone how great China was. The part of his theory I can buy is that the Chinese didn't stop at East Africa. They sailed aro Ok, so this was really interesting and he had a pretty good basic thesis. In fact, I could totally buy the most important 10% of his theory. Basically, no one disputes that the Chinese had this enormous fleet that set sail in 1421 and went across the Indian Ocean to the east coast of Africa. They were sent on a mission to trade with different countries and basically tell everyone how great China was. The part of his theory I can buy is that the Chinese didn't stop at East Africa. They sailed around the southern tip, up the west coast, and across to Brazil. Then they bumped around the coasts of what is now Brazil and Argentina and then sailed back to the Indian Ocean. Makes sense. They were told to sail as far as they could and explore, and they had the ships to do it. Plus they were mapping the southern stars and learning about navigation. But the author doesn't stop there. He says, basically, that the fleet split up and then sailed, literally, everywhere else in the world. One group went up the east coast and explored everything from Puerto Rico to Greenland, one group explored Mexico and California, one group explored Antarctica(!) and Australia. Basically, the Chinese went EVERYWHERE.....except Europe. For some reason, they didn't stop anywhere in Europe. At all. Even though they knew there were countries there they could trade with. Plus whenever this guy sees a map that doesn't help his story, he comes up with some excuse, including gems such as "they must have seen an iceberg and thought it was an island" or "they must have traveled by these islands at night and accidentally thought they were a continent". Right. I really wanted to like this book. Sadly it became a long, non-stop series of suppositions along the lines of Chariots of the Gods. If I had to read one more mention of the Asian chickens in the New World I would have gone mad!Or another use of "the ONLY thing this could mean was that the Chinese had been there before anyone!" He has a lot to learn about inescapable conclusions and the evidence leading up to them. I gave it one star for the few things I actually found interesting, but given the I really wanted to like this book. Sadly it became a long, non-stop series of suppositions along the lines of Chariots of the Gods. If I had to read one more mention of the Asian chickens in the New World I would have gone mad!Or another use of "the ONLY thing this could mean was that the Chinese had been there before anyone!" He has a lot to learn about inescapable conclusions and the evidence leading up to them. I gave it one star for the few things I actually found interesting, but given the rest of the book it makes me want to double check even those. This review has been hidden because it contains spoilers. To view it, click here. It's rare that I would waste space blasting a book. Life is short and time is a scarce resource. I'd rather just drop a book unworthy of finishing and move on to a new one. This time, though, I think 1421 merits further explanation because of the sensational success it has experienced worldwide. Simply put, 1421 is junk history posing as "real history." Gavin Menzies has spun a fantastical and interesting tale out of the very real events surrounding the massive Chinese treasure fleets of 1421. Hi It's rare that I would waste space blasting a book. Life is short and time is a scarce resource. I'd rather just drop a book unworthy of finishing and move on to a new one. This time, though, I think 1421 merits further explanation because of the sensational success it has experienced worldwide. Simply put, 1421 is junk history posing as "real history." Gavin Menzies has spun a fantastical and interesting tale out of the very real events surrounding the massive Chinese treasure fleets of 1421. His thesis--that the Chinese discovered the New World in the 1420s, mapped it, and that it was their maps that European explorers used when sailing for the New World (including, he argues, Columbus). Built by a Ming emperor to gather in tribute from the ends of the Earth, the fleet was one of the last acts of imperial hubris. Shortly after it set sail, the emperor died. His son, in replacing his father's policies, had the fleets destroyed upon their return, along with records gathered during the voyage. Starting with that sparse introduction, Menzies proceeds to gather bits and pieces of evidence stretching from China itself to the Indian subcontinent, from the Congo to Patagonia and beyond, and levies the evidence to tell a tale of the massive Chinese fleet charting the New World the greater part of a century before Columbus set sail in 1492. It is an extremely interesting and, if it were true, a ground breaking discovery and thesis. Perhaps it is true. But likely, it is not. As I started reading it, the first question that came to mind for me was this: in the almost six centuries since these events happened, why has no one else suggested that the Chinese arrived first? Menzies explanation is that historians generally lack the skill set necessary to uncover the truth, a skill set that he has as a former captain in the British Navy. Unlike most historians, Menzies argues, he can read a chart, understand what he's looking at, and glean from these 15th century charts things that no historian would otherwise notice. Yeah. It's a little bit of a stretch. I would be surprised to find that no historian has ever had the skill set to learn maritime charts and understand how to read them (heck, Theodore Roosevelt when only an undergraduate student at Harvard, researched and wrote a book of naval strategy -- "The Naval War of 1812"--that became a classic and a text book used by both the US and British navies for decades after it was published). That being said, I gave Menzies the benefit of the doubt. I've long been intrigued with China and its history, and I think I wanted to believe that history as we have been taught might not be true. How interesting would it be for America to have been discovered by the Chinese? As I read, though, red flags continued to pop up. Out of only sparse details, Menzies would assert "conclusive proof" that his theories were finding relevance. Finally, over two hundred pages in, I decided to check into what critical review might have said about his methods and evidence. I reasoned that if Menzies is correct, or even has a good theory, then the academic community would support his findings with further research. I went to the internet. Critical acclaim was anything but what I found. In addition to finding entire sites dedicated to debunking Menzies myths, I also found that historical lectures had been given explaining and demonstrating that what Menzies proposed was just that--a proposal. Be it even true, the evidence was not there, not was the reasoning clearly logical. --Menzies claims that Chinese anchors have been found off of the coast of California, but fails to document them. --1421 says that Chinese DNA is found in North America natives, but fails to account for the influx of Chinese immigrants in the 17th century. --Menzies finds what he claims are chickens unique to Asia living in Peru, but fails to note that Peru exported millions of tons of silver to China and brought back silk and porcelain (and presumably other things, like, for example, chickens) throughout the heyday of the Spanish during the 16th through 17th centuries. And that's just to start. "The study of history is likely to reward anyone willing to undertake it in a quest for better understanding of who they are, how they became what they are, and what they might hope to become. The manufacture of a history that never existed rewards only those who make money by deceiving the public." Poorly researched. Highly speculative. A little condescending. I found myself wondering throughout this book, how the hell this guy made the conclusions he did. After about 150 pages into it, I started noticing he wasn't making as many citations as he should be. A lot of his research comes from his own experience as a submarine captain, which he thinks puts him in a better position than other scholars before him. He also makes excuses for the Chinese for basic mistakes, "the land was connected b Poorly researched. Highly speculative. A little condescending. He also makes excuses for the Chinese for basic mistakes, "the land was connected by ice, so they figured it was the same island" or "they could have passed by this at night so they might not have seen this". Further, when there's some completely inexplicable conclusion, he reminds the reader, "the Chinese had expert carpenters, stone masons, cartographers, astronomers, etc., so they could have figured this out, I believe they did." When they make a basic mistake, he chalks it up to mere oversight, but yet when the impossible is accomplished the Chinese were able to do it because they were experts? The book does have an interesting premise, which is why I give it one star. Ultimately, I feel he rushed to judgment. He went about the book as a mystery, not as historical fact. I found it frustrating when he'd say "check the website for further information" or "negotiations are underway for the release of these documents". I bought this book December 2006 on Indonesia Book Fair. The real prize was IDR75000, but I got it for only IDR49000 (still one of expensive books I've ever bought). The book's content amazed me. It's a kind of re-writing world history that attempted to tell us that Magellan, Colombus and other Western discoverers were only followers of a path built by Chinese sailors under the command of Zheng-He (or Cheng-Ho, his popular name in Indonesia) on Emperor Zhu-Di era. I like Menzies' style in writing. I bought this book December 2006 on Indonesia Book Fair. The real prize was IDR75000, but I got it for only IDR49000 (still one of expensive books I've ever bought). I like Menzies' style in writing. Seemed that he's trying to be honest, because the greatest part he did for the book was arranging other people's work ; he wondered everytime he found a match in his research; he wanted to make sure that the proof are not coincidences. He showed that he's only a writer for things that alresdy exist, for history that never be written in decent manner. You may find many discussion and critics about the book when you surf on internet. Americans, many of them, don't feel comfortable about replacing their superior Colombus with Chinese wanderers they never heard before. As for me, I do not have enough scientific authority to judge whether all the writer said in the book are true or not, but I really respect all research he's done for the book. He said it took him forty years of research; here, there and everywhere. He went to many parts of the world in finding and matching the proof to support his theory. It inspired me, at least to think that when there's a will, there's a way, especially when I get stuck in finishing one of my writing work. What a story this is! Do you remember Erich von Daniken? He had quite a story to tell, too. Menzies writes that the Chinese, during the reign of a single emperor at a time over five decades before the voyages of Columbus, spared no expense building treasure fleets with the centerpieces being huge flat bottomed square bowed junks 180 by 450 feet flying bright red silk sails on up to nine masts surrounded with lesser support ships that carried everything from food to horses in a quest to discover t What a story this is! Do you remember Erich von Daniken? He had quite a story to tell, too. Menzies writes that the Chinese, during the reign of a single emperor at a time over five decades before the voyages of Columbus, spared no expense building treasure fleets with the centerpieces being huge flat bottomed square bowed junks 180 by 450 feet flying bright red silk sails on up to nine masts surrounded with lesser support ships that carried everything from food to horses in a quest to discover the world and plant colonies in the process. To this extent, it's all true. But then, Gavin Menzies runs with the ball. 1421 tells of of the voyages these fleets undertook that reached and accurately mapped, within the limits of the technologies of the time, the coasts of much of North and South America, Australia and Antarctica. Page after page of revelations kept me eagerly reading. I thought it would be interesting to use the Internet to look up some of the artifacts, standing stones, and buildings that Menzies mentions. I went online only to discover that though the items mentioned do exist (check out the Newport Round Tower and the Bimini Road, for examples) there is no evidence for the claims Menzies makes and very good evidence for their existence that has nothing to do with any Chinese visitors. At this encounter with real science I had read past the middle of the book but, feeling duped, stopped reading. My suspicion had been aroused even before I did my online checking. Menzies doesn't write with the care and deliberation of a historian. He follows a pattern. He looks at an ancient map, puts his experience as a navigator in the Royal Navy to use, comes up with a hunch about a Chinese visit to some point on the globe, visits the location and discovers that, sure enough, there is strong evidence for exactly what his hunch had told him might be the case. The Chinese visited! Move on to the next place. Thus does he move along around the world revealing what he would have us believe are facts. From time to time he admits there might be other reasons for something he finds, but little time is spent bothering with them because his view is obviously correct. Chinese treasure fleets did sail starting in 1421, reaching as far as the east coast of Africa, long before the famous voyages made by the Portuguese around Africa and into the Indian Ocean. It's a fact that the Chinese were all over the waters off Vietnam, Indonesia, Malaysia, India and the Persian Gulf long before Europeans arrived over the waves. That is no little thing, reason for admiration, proof that Chinese civilization and technology was second to none at the time. It is also a fascinating fact that this expansive effort was stopped abruptly, leaving the world to be "discovered" by the Europeans as China turned inward. This is a completely enthralling book dedicated to a really ballsy thesis--that the treasure fleets of the Ming Dynasty charted most of the world, including North and South America as well as Siberia and Antarctica, in 1421. According to Menzies, European explorers including Columbus, Magellan, and Cook were working off of already existing charts that had been essentially stolen from the Chinese when they made their own voyages of exploration. There is an overwhelming amount of evidence presented This is a completely enthralling book dedicated to a really ballsy thesis--that the treasure fleets of the Ming Dynasty charted most of the world, including North and South America as well as Siberia and Antarctica, in 1421. According to Menzies, European explorers including Columbus, Magellan, and Cook were working off of already existing charts that had been essentially stolen from the Chinese when they made their own voyages of exploration. There is an overwhelming amount of evidence presented--everything from ancient maps to European ship logs to shipwrecks to lingual analysis to plant migrations to DNA. Some of the declarations are fairly easy to believe, such as the notion that the Chinese were well aware of the location of Australia. Others seem awfully far-fetched, like the declaration that Chinese sailors built the Bimini Road to repair reef-savaged junks. Taken as a whole and in isolation, this is an incredibly compelling and fascinating argument. Menzies claims the support of an armada of Chinese scholars--this isn't merely one guy out on a mission of his own. And he has plausible-sounding explanations for most possible objections. Is it true? I'll admit I have no idea. A part of me wants it to be--it's just such a cool idea. But I'll freely admit I don't have nearly the background required to evaluate this. There are dozens of websites that seem devoted to proving him wrong--although there are also dozens of websites devoted to proving the moon landing wrong, too, so that doesn't necessarily mean much. I'd be very much interested in reading a rebuttal by a group of qualified historians. But again, my own lack of knowledge hampers me here--I don't actually know who is considered a respected authority, who is a crank, and who is just inflexible and has an axe to grind. It's certain that there's a lot of "established" history that we're aware is not actually true. But at the same time, this just seems too good to be true. And there's definitely a bunch of places where I think he's making unjustified leaps of logic. We Westerners are of course familiar with the historical period known as the Renaissance; taking place between the 1300s and 1600s, it's the period when Europeans finally crawled out of their Dark-Age hole, rediscovered such ancient Greek concepts as science and philosophy, and started doing such things for the first time as sailing to the far corners of the planet. But did you know that China as well went through its own brief Renaissance at the same time, actually sailing around the planet on a regular basis a full 50 years before the Europeans started doing so, and that it was the maps and tips these Chinese gave to the Europeans that allowed the great figures from the "Age of Discovery" to make their voyages in the first place? Well, okay, so not everyone completely agrees with this theory; but it's the surprisingly strong one being espoused in the books 1421: The Year China Discovered America and 1434: The Year a Magnificent Chinese Fleet Sailed to Italy and Ignited the Renaissance, both of them by a retired British naval commander named Gavin Menzies, a hobbyist scholar who just happened to start stumbling across more and more evidence during his studies to support the theory mentioned above. See, the whole thing is problematic, because the Chinese actually went through a major period of isolationism right after this brief period of world-traveling, specifically as a overreaction to Ghengis Khan and his Mongol Hoard Horde(! ), which had actually held and ruled China all the way up to the beginning of the 1400s, or in other words the beginning of the Ming Dynasty in that country. These were great reads, books that really crank the gears of the mind into action (why, just the descriptions of a glittering, wealthy Southeast Asia in the 1400s is worth the cover price alone); I'll warn you, though, that these are denser books than the usual airport and beach reads, not exactly academic in complexity but definitely stories you need to pay careful attention to while reading. That said, they both get a big recommendation from me, especially for the growing amount of people in the western half of the world who are becoming more and more curious these days about the mysterious history of the eastern half. In 1421: The Year China Discovered America, Gavin Menzies presents evidence that China not only discovered North and South America before Columbus was born, but also rounded the Cape of Good Hope, explored the North and South Poles, discovered Australia, and circumnavigated the world, visiting every continent except Europe. The reason this information isn't widely known is because China became xenophobic after these great voyages and all records of the voyages were destroyed. However, enough evid In 1421: The Year China Discovered America, Gavin Menzies presents evidence that China not only discovered North and South America before Columbus was born, but also rounded the Cape of Good Hope, explored the North and South Poles, discovered Australia, and circumnavigated the world, visiting every continent except Europe. The reason this information isn't widely known is because China became xenophobic after these great voyages and all records of the voyages were destroyed. However, enough evidence of these voyages remains to provide compelling proof. Menzies focuses on maps of the world made before the European explores were born and points to journals showing that Columbus, Magellan, Cook, and others had maps of the areas they were "discovering" before they ever set sail. Magellan knew where the Straight of Magellan was by using a map. Cook found Australia the same way. Columbus didn't discover America on accident; he simply followed the map he brought with him. In fact, when Columbus landed on Puerto Rico, he found an earlier Portuguese voyage had already settled there ahead of him. (The Portuguese landed in Puerto Rico a short ten years after the Chinese.) Columbus wasn't even the first non-Scandinavian European to visit America! Also, Columbus himself admits that the Chinese had been to America before him. Where did these maps come from? Menzies shows that Europeans who visited India came into contact with the Chinese and brought maps back to Europe. Portugal kept the maps a secret from the rest of Europe to give them an advantage in the spice trade. However, Columbus and his brother copied the maps, altered them to make it look like it was easier to reach the Spice Islands by going west rather than east and tricked Spain into financing a voyage to the Americas. Menzies also presents a mountain of evidence of Chinese explorations around the world including Chinese stone markers and observation pyramids, ancient Chinese shipwrecks, including one found in San Francisco Bay, Chinese artifacts found around the world, Asian plants and animals introduced to the Americas, American plants and animals brought back to China, legends and cave drawings of indigenous peoples, and Native Americans with Chinese DNA who speak languages similar to Chinese. In addition to presenting compelling evidence, Menzies also provides interesting historical tidbits. For example, the Chinese had trained otters who herded fish into nets. He provides fascinating descriptions of medieval China, which made me wish the grade school history classes I took didn't focus solely on Europe and European America. It is hard to explain the awfulness of this book fact-wise(the fact that there is actually a web site dedicated to to doing this should tell you something). It consists of a long list of anecdotes along the lines of "when I was in the navy, I saw a pile of moss covered rocks on the beach in South America that had a shape vaguely similar to that of a collapsed Chinese temple - further proof of Chinese contact with America!" I like a good wild theory as much as anyone, and typically enjoy reading It is hard to explain the awfulness of this book fact-wise(the fact that there is actually a web site dedicated to to doing this should tell you something). It consists of a long list of anecdotes along the lines of "when I was in the navy, I saw a pile of moss covered rocks on the beach in South America that had a shape vaguely similar to that of a collapsed Chinese temple - further proof of Chinese contact with America!" I like a good wild theory as much as anyone, and typically enjoy reading about them and considering them ("The Deep Hot Biosphere" is a favorite), but I need a FEW FACTS to make it palatable - not an author posturing as if he was an authority to trick people without strong analytical abilities in to believing him. Menzies just rolls out a long list of vague assertions with really no proof other than his own belief(which I don't doubt), and acts as if a long list of vague assertions has more validity together than they would separately. I am not some ivory tower type either, who gets all wound up because sources are vague, or a few of the facts might be slightly off. I'll overlook some speculation or inaccuracies if the actual evidence you DO have is compelling and you are just filling in some blanks. But 100% speculation and 0% facts is a little tough to swallow. There are some books that come to our attention through curious routes and then strike us as books "we were meant to read." I suppose in some ways, this is true for many books. Perhaps it is proof of the old saying, "Chance favors the prepared mind." When my GoogleLitTrips.com project was selected by the Asia Society to receive the Goldman Sachs Foundation Prize for Excellence in Education, I was invited to New York City to receive the prize and there, in passing, it was suggested that 1421 migh There are some books that come to our attention through curious routes and then strike us as books "we were meant to read." I suppose in some ways, this is true for many books. Perhaps it is proof of the old saying, "Chance favors the prepared mind." When my GoogleLitTrips.com project was selected by the Asia Society to receive the Goldman Sachs Foundation Prize for Excellence in Education, I was invited to New York City to receive the prize and there, in passing, it was suggested that 1421 might be a good book to do a Lit Trip on. Though I found the book a bit outside of the parameters of the Lit Trip project, I found it eye-opening to say the least. I had forever been aware of the "controversy" relating to the claims that Christopher Columbus "discovered" the new world. It had long been in my cognizance that the Vikings had been to the Americas earlier. And, of course, how can one claim to have discovered a land when the land one "discovers" is inhabited by millions of people with clear signs of advanced civilization? I had also only recently become aware of the extent of the Portuguese sailing history, suggesting that Columbus was following fairly well-known routes that the Portuguese were well aware of. But, this book, which offers extensive evidence that the Chinese were sailing the entire world long before either the Portuguese or Columbus was essentially complete news to me. One beauty of the book for me is it's support for my serious belief in photographer Aaron Siskind's quote which I had posted above my black, then, green, then white board in my classroom for over 30 years. It was Siskind who said, "We look at the world and see what we have learned to believe is there." I love this book because it verifies that what we know, or what we believe we know about history (and perhaps everything else) quite possibly is sufficiently less than what there is to know and therefore an indicator that we ought to always make room for the possibility that a complete reality check may always be in order. Was it coincidence then that through virtually no pre-planning or awareness on my part, that in traveling to New York to receive my prize, that "coincidentally" a friend of mine from the Apple Distinguished Educator group would "happen" to be invited to attend the ceremony, not knowing that I was to be one of the recipients? And that he would because of this "coincidence" invite me to join him in presenting at a conference in China on 21st Century Learning? And, that, I would then use part of the prize money to fund my attendance where I would find ample evidence of the stories of 1421 to be documented in multiple museums? It is true and always refreshing to be reminded that "The more we know, the more we come to understand how little we know." Gavin Menzies, a former submarine commander in the British navy and amateur historian, argues in this book that between 1421 and 1423 squadrons from Zheng He's fleets reached the Americas prior to the Europeans. The problem is that the author offers very little proof for this provocative theory. As the author acknowledges in his introduction, later Ming Dynasty rulers destroyed all records documenting the sea voyages made by the Chinese during Zheng He's rule. Thus, the author bases his argument Gavin Menzies, a former submarine commander in the British navy and amateur historian, argues in this book that between 1421 and 1423 squadrons from Zheng He's fleets reached the Americas prior to the Europeans. The problem is that the author offers very little proof for this provocative theory. As the author acknowledges in his introduction, later Ming Dynasty rulers destroyed all records documenting the sea voyages made by the Chinese during Zheng He's rule. Thus, the author bases his argument on three claims: 1) Chinese maps from as early as 1428, allegedly showing parts of North and South America and some Atlantic islands, which the author claims, European explorers (including Columbus) used to their advantage 2) evidence of pre-Columbian contact between America and Asia based on flora and fauna exchange that he asserts must have occurred as the result of human contact and 3) his past maritime experience as a British naval officer (of which the author regularly reminds the reader ). I finally finished this book. For some reason, when I read non-fiction, I fall asleep, no matter how interesting the subject matter. So this is a long time coming. Basically, the book is about how towards the end of China's expansive age, they sent out a gianormous fleet of huge ships to collect tribute from all the nations of the earth in a good Buddhist way. And as a bonus, they were to chart the world and update all their scientific data (or whatever the 15th century Chinese terminology for it I finally finished this book. For some reason, when I read non-fiction, I fall asleep, no matter how interesting the subject matter. So this is a long time coming. Basically, the book is about how towards the end of China's expansive age, they sent out a gianormous fleet of huge ships to collect tribute from all the nations of the earth in a good Buddhist way. And as a bonus, they were to chart the world and update all their scientific data (or whatever the 15th century Chinese terminology for it was). And then, because they did this, the charts spread to Europe and gave them the boost they needed to go exploring and try to catch up to Chinese navigational superiority. It did help that while this big fleet was gone, the Chinese government turned upside down and they decided they didn't want to deal with the outside world anymore, so they burned all their evidence that these voyages ever happened. On a similar note, why was there no exploration of the eastern side of Central America? Shouldn't one of the priorities have been to create that direct route--especially with a fleet so large? No maps ever show farther than the Caribbean Islands. If one of the points of the exercise was to take detailed notes and charts, why weren't the people who stayed in the places they landed at (shipwrecked usually) still interested in keeping records? They had promises that they would be rescued, and since they didn't know the political climate at home, they should have assumed any records from actually living in the land would be as valuable or more to their homeland. So why has no one found these kinds of records? Anyway. Those are some of my concerns. Mostly, I didn't like the parts where he puts his conjecture forward as though this is the only way it could have possibly happened. I did like when he tied it all back to the Europeans though--the way they got ahold of the charts and began to use them for themselves. I believe that people were exploring the oceans and the world before the Europeans became the driving force behind things. I don't think that means we should think less of the European explorers (give Columbus his holiday back!). I would most certainly not be here or the same without them. Especially since the European influence has been stronger, even if it was not as nice as the Chinese who "colonized" America first. The author starts off with his assumption that the famous European explorers used European maps that were copied from old Chinese maps because they showed yet uncharted land. In 1421, a large Chinese fleet set sail and discovered the world. Based upon the assumption that the large Chinese armada sailed with a speed about 4.8 knots, combined with the ocean's currents, the author is able to reconstruct the entire course of the Chinese armada and to pinpoint each location of the different armada's o The author starts off with his assumption that the famous European explorers used European maps that were copied from old Chinese maps because they showed yet uncharted land. In 1421, a large Chinese fleet set sail and discovered the world. Based upon the assumption that the large Chinese armada sailed with a speed about 4.8 knots, combined with the ocean's currents, the author is able to reconstruct the entire course of the Chinese armada and to pinpoint each location of the different armada's on any given day. In his opinion the Chinese fleets sailed around Cape of Good Hope, visited the coast of West Africa, the Cape Verde Islands where the fleet splitted into a southern direction and a northern direction. The southern fleet then explored South America, then went on to discovering Antartica, and then back via the Kerguelen to Western Australia upon returning to China. The northern fleet discovered the Caribean, went to Greenland and then sailed through the Arctic Ocean and North Pole back to China. Another fleet visited the Maya's and established Chinese colonies there. This is all supported by little evidence, and except for some marginal examples the Chinese left any clues what so ever. Let me give you an example of how the author describes the discovery of Guadeloupe: the author assumes the fleet travels by the same route as Columbus did 70 years later. The author then assumes that they were traveling by night, because the island of Guadeloupe is charted, but other islands in the near surrounding have not. The only reason is that the Chinese were traveling by night and assuming it is new moon, the exact date is given: 25 November 1421. The anamolies with the island of Guadeloupe as chartered on the map with the real geographical situation is easily explained: the Chinese junks were low on the water and therefore it's obvious that they didn't see any bays. Also, the fact that Guadeloupe consists of two different parts is easily explained, because when the Chinese fleet was in the area, it was early in the morning and the sun must have distorted their vision. The fleet then goes northbound, where the map shows a lot of islands that aren't there, easily explained by the fact that the sealevel has risen with more than 6 feet since 1421, so a lot of islands must have overflooded with water since then, like this only occured in this region. The Chinese fleet then must have been low on water and therefore must have been visiting Bimini. The (in)famous Bimini road is explained by the fact that the Chinese fleet must have lost their ballast stones to recover some ships that obviously must have been damaged by the storms in the region. And it is things like these why this is obvious drivel and I can go on and on. At this point in the book I started to think about Erich von Däniken and decided to place Gavin Menzies in the same category. So why 3 stars? If you want to read this as a science and historic book I will give this 1 star - for it's obvious not. But as a historical novel, apart from all the pseudo-science drivel, it's an enjoyable read. I suspect it doesn't matter to Gavin Menzies. This book is ofcourse highly controversial and the author has fared well; his next book claims that it were the Chinese who started the Renaissance in Europe. Both books have sold well and it will only spur Gavin Menzies on to write more of these books. I've decided to shelf this one at chapter 4, page 197 and so withholding a rating in fairness. Maybe I'll return to this book when I have far more time to kill hunting down and cross referencing all the quasi-citations for the actual who, where, how, and why seemingly so often unprovided. That said Menzies really could have saved face if he treated this subject like a Dan Brown novel. Just think of the movie that could have been made. I enjoyed the documentary, but this book has so much criticism I've decided to shelf this one at chapter 4, page 197 and so withholding a rating in fairness. Maybe I'll return to this book when I have far more time to kill hunting down and cross referencing all the quasi-citations for the actual who, where, how, and why seemingly so often unprovided. That said Menzies really could have saved face if he treated this subject like a Dan Brown novel. Just think of the movie that could have been made. I enjoyed the documentary, but this book has so much criticism. Great premise though, intriguing at first, quality printing, easy to read. Unfortunately it turns into a wild good chase fairly quick, and all those citations... whenever I picked one to lookup it was either a mere comment, a totally unsubstantiated claim or a vague source that required an independent investigation of its own to little avail. Wow. The preponderance of evidence not only turns accepted European history and world history on its head, but also makes one wonder about the question the author poses as to whether or not we could be speaking Chinese now, rather than English, and have Buddhism as the dominant world religion, as well as my own personal question : did someone perhaps decide that the world was better off allowing Europe to take another three centuries to figure out what the Chinese already knew? Given the cruelty Wow. The preponderance of evidence not only turns accepted European history and world history on its head, but also makes one wonder about the question the author poses as to whether or not we could be speaking Chinese now, rather than English, and have Buddhism as the dominant world religion, as well as my own personal question : did someone perhaps decide that the world was better off allowing Europe to take another three centuries to figure out what the Chinese already knew? Former British submarine commander and amateur historian. Menzies is most known for his book "1421: The Year China Discovered the World" which claims that the Chinese admiral Zheng He discovered America in 1421. 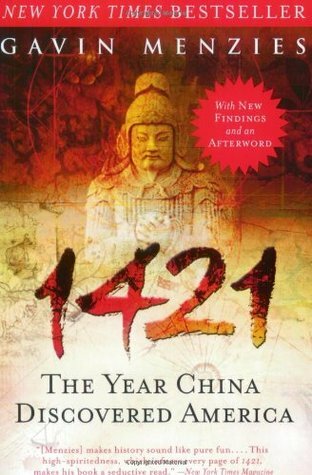 In his follow up book "1434" He claims that the European Renaissance was sparked by the Chinese.